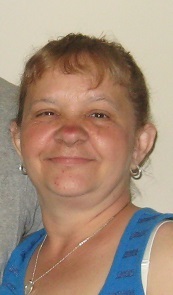 Tina L. Deeter, 58, of Oil City, PA. , died Saturday April 6, 2019 in her home following a period of declining health. Born August 2, 1960, she was the daughter of Joseph & Sandy Bay. Tina enjoyed dancing and playing bingo. She liked to make handmade blankets and distribute them to family and friends. Tina had made many friends through her relationships with The Pointe in Oil City and the Challenge Center in Franklin. She was married to Anthony L. Deeter Sr. on August 30, 1998 and he preceded her in death on July 4, 2010. She is also survived by long time companion Ron McElhaney. Interment will take place at the convenience of the family. Memorials may be made to the Reinsel Funeral Home 116 Bissell Avenue Oil City, PA. 16301 to help the family with funeral expenses.